Iddirs are the dominant form of autonomous and voluntary indigenous associations in Ethiopia. Their roots lie in traditions of rural self-help which migrants adapted to the requirements of urbanisation from around the beginnings of the 20th century. As civil society actors, Iddirs have proved to be great survivors within a centralised and often suspicious state. They were courted by officials of the Empire, supplanted by the Dergue and are now acknowledged as the voice of civil society in development efforts. There are over 4,000 registered Iddirs in Addis Ababa alone. The basic function of the Iddir is to help families bury their dead. It does this by providing tools and labour for digging graves; tents for the mourners; money to meet the burial costs; financial support for the needs of the family; and emotional support for the bereaved. To benefit from these services household representatives pay regular dues and take active part in the ceremonies. As one of the poorest countries in Africa, successive governments have sought to engage the population in self-help activities. While this was originally motivated by the governments’ desire to shift the burden of service provision, it became essential from the 1960s onwards when Ethiopia’s donors began to press for the involvement of non-state actors in development. For Government, the Iddirs were the acceptable solution to this new donor requirement. International NGOs have harnessed the potential of Iddirs for literacy campaigns, formal education, micro-credit operations, slum rehabilitation, HIV/AIDS awareness and many others causes. ACORD, which specialises in Iddirs, has worked with 220 groups covering 10,200 households in Dire Dawa and Addis Ababa since 1999. The broader scope of Iddir activity has made capacity building a necessity for leaders and members alike. ACORD therefore provides training in formal procedures, governance, financial transparency, project management and latterly, advocacy. The higher profile and ambitions of Iddirs have signalled the need for umbrella organisations. In 2000, the Tesfa Social Development Association (TSDA) was formed as a coalition of 26 Iddirs representing 4,000 households and a population of 29,000. TSDA’s original vision was to help Iddir members who had fallen behind with their dues. Its current activities include upgrading slum housing, assistance to elderly and orphans, sponsoring skill training and job creation, credit and savings, providing health services and kindergartens, and advocacy against harmful traditional practices. With a relatively enabling legal environment, Iddirs have enjoyed explosive growth in urban areas since the 1960s. This is a reflection of migrants’ needs for new forms of self organisation to address the multiple challenges of the new urban environments. Once based on ethnic affiliation or locality, there are now more than a dozen different types of Iddir, each with a different membership. Newer Iddirs are composed separately of women, youth, displaced peoples, squatters and mosques. Modern Iddirs have now found their way back to the rural areas from which their inspiration came, and no development activity is conceivable in modern Ethiopia without engaging the Iddirs as partners. Iddirs used to face criticism that they attend to the dead rather than the living. The lesson of their success is, however, that social movements must have at their core an issue that is of burning, common interest to a population. 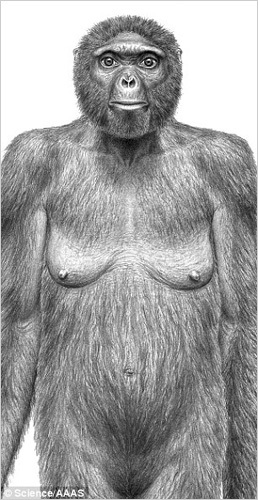 In Ethiopia, that has proved to be burial. 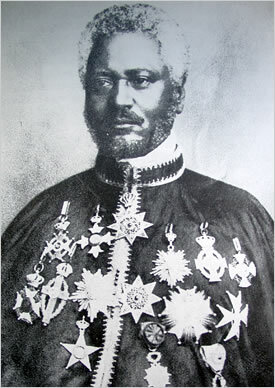 We made recently a very interesting acquaintance with this very creative landsman; Mr. Teshome Berhanu Kemal. He has written and published numerous books. Some of his books are stories specially written for kids which made Mr. Teshome a very interesting figure for Lissan Magazine. After he kindly sent us essential background information about his works and himself, we are hereby presenting him as follows. Published: six children’s’ books (Yeteret Abat, Andit T’inchelna Q’ech’ine, Dereto, Alemitu ena Gumarewu, Gorade Yagebachiwu Lielt ena Leloch Asdenaqi tertoch, Esubalewe ena Yegenete Wof. 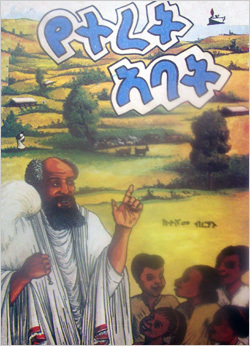 Yeteret Abat (The Father of Tales): One of the voluminous children’s’ books in the country with unique narration and selected tales. Yeteret Abat (The Father of Tales) is one of the first children’s books published by the former Kuraz Publisher (now replaced by Mega Publisher). All the stories including some bridges for the main tells are narrated by the Ye Teret Abat. The book contains some 30 selected tells most of which the author learnt from his mother as a kid. The rest are the author’s creation and that old stories which retold by the author. 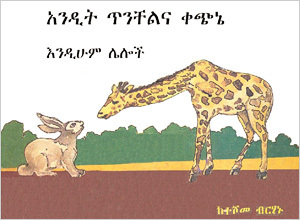 Andit T’inchelna Q’ech’ine (A Rabbit and A Giraf) is children’s book for beginners, published by the former Kuraz Publisher (now replaced by Mega Publisher). All stories are the creations of the author. 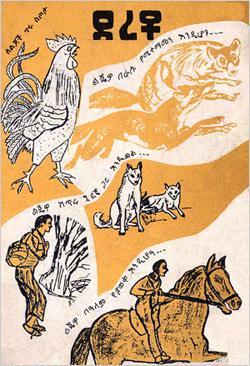 Dereto (a rooster with big chest) published in 1992, contains stories like Dereto (a young rooster that made itself a hero), Feresegnaw Hassen, (Hassen the horse race contester ). Buchi ena Guadegnaw (Buchi the honest Dog and his Friend), Fichagona Yemot Medhanit (Fichago in search of death winning drug). Esubalew ena Yegenet Wof (Esubalew and the Bird of Paradise), published in 2003, it is the adventure of a child called Esubalew to paradise. The story deals with kindness to animals and conversation of our natural resources. Alemitu ena Gumarewu (Alemitu and the Hippopotamus) It is a story about a girl who loved the Hippopotamus for his kind deeds. It also contains some other stories. Ye Ezop Teretoch (The Fables of Aesope) all are presented as retold by the author. Mr. Teshome is an author of dozens of research papers dealing with different subject matters. He is multi-talented with further skills of Cinematography, filming, directing, editing, writing script, and narrating. He has written hundreds of articles for different local News papers (Addis Zemen, Yezareitu Ethiopia, Amharic Zena), Tourism Magazines (Yekatit, Amharic Sendeq, Amharic Tele Negarit, Amharic and English EHNRI Newsletter, Amharic and English Efoyta), English Newspaper and Magazine design of house organs; among others Editor (columnar) of “Meftihe Bihonwo, & Admas,” are columns worth mentioning. The author has a huge number of academic background and a long list of professional achievements which shows the base and source of his multi-directional creativity. We recommend Mr. Teshome as a very valuable network partner.